Geosciences role in making Tucson the "Science City"
The University of Arizona's 28-page supplement in Sunday's Arizona Daily Star newspaper is one of the many high-profile activities taken by the school to build Tucson's reputation as "Science City." This now annual feature showcases a wide range of science research and programs that Joaquin Ruiz, Vice President of Innovation & Strategy, Dean of the College of Science, and Professor of Geosciences, says "must be relevant both internationally and to our home community." This year's edition includes reports from a few geoscientists, including Peter DeCelles describing work on the structure and tectonics in the Himalayas to unravel how mountains and basins form, Matthew Salzer reporting on the use of tree rings to track changes in the Earth's climate going back nearly 5,000 years, Thomas Zega discussing studies of microscopic stardust to understand the origin of the Milky Way and our solar system, and Jon Pelletier's work on predicting post-wildfire erosion better. Jon's work has direct application to work we are doing at AZGS to predict and mitigate debris flows and related hazards following wildfires. 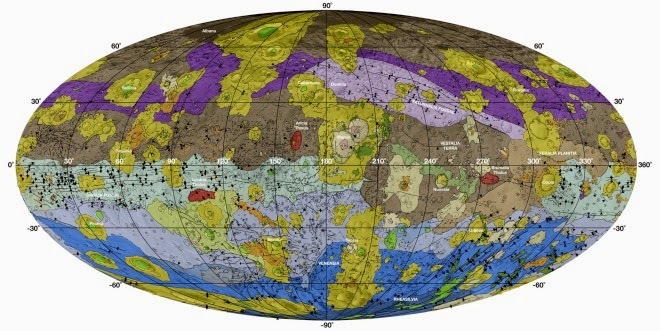 A new geologic map of the asteroid Vesta has been published by Arizona State University planetary scientist David Williams and his colleagues. It's online in the December special issue of the journal Icarus on The Geology of Vesta. They propose a chronostratigraphic scheme and geologic timescale for Vesta with four periods based on major impact events. The conclude that the proposed vestan geologic timescale is comparable to those developed for other airless terrestrial planets, and Vesta’s youngest period is not based on rayed craters, due to different space weathering. The University of Arizona Mineral Museum looking for a full-time, permanent position, collections manager. 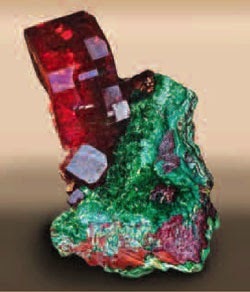 The mineral museum is located in the Flandreau Science Center [right] on the University of Arizona campus in Tucson as part of the Department of Geosciences.Duties include managing current mineral collections, museum displays, outreach programs and the day to day operations of museum. Reuters reports that the National Mining Association and the American Exploration and Mining Association filed an appeal late on Tuesday with the 9th U.S. Circuit Court of Appeals, to overturn last month's decision by U.S. District Judge David Campbell that the U.S. 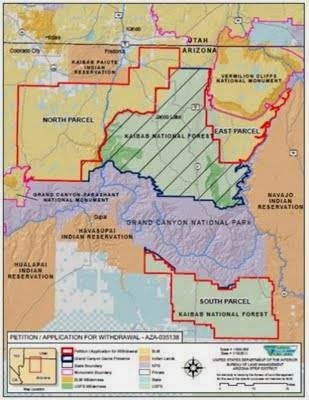 Interior Secretary was empowered under federal law "to err on the side of caution in protecting a national treasure - Grand Canyon national park" by banning new uranium claims and exploration in northern Arizona outside the park. Exploration for helium in Arizona heated up this year with two wells drilled in the Holbrook area where it was produced for decades. 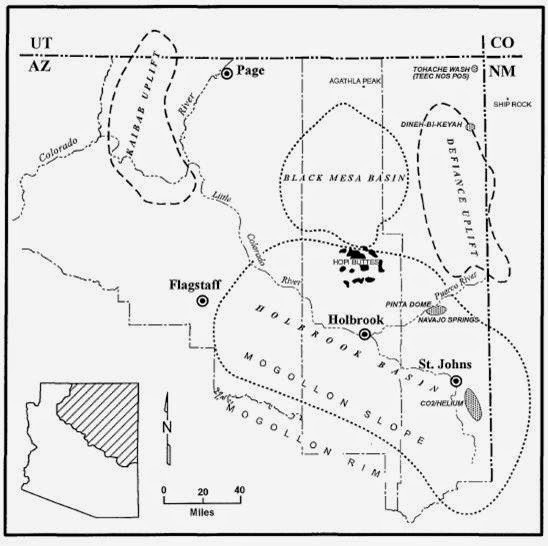 [Right, AZGS map of helium fields in Arizona] One of our correspondents passed along a new job posting for a Phoenix-based geologist to help with helium exploration in the region. Progressive Global Energy & Natural Resources posted the job notice on CareerBuilder.com on November 14 (Job Reference1041244). Our client, is in the business of addressing the supply of helium to industry, government, medical and the research communities. Our client, has accumulated working interests in oil and gas lease holdings composed of more than 35,000 acres in a geographic region that historically has been recognized to contain some of the highest helium concentrations found. The extent of our clients recoverable helium reserves will be identified by drilling and third party engineering analysis. The fields will be developed through production well drilling and completion, infrastructure gathering system and processing equipment construction. Our client is located in Phoenix, Arizona and is looking for an experienced Exploration Geologist to participate in this exciting opportunity. The new president of the Nevada Mining Association has extensive ties to Arizona. The Association announced that Dana Bennett [right, Linkedin photo], the former regional director of the Nevada Governor’s Office of Economic Development and current owner of Bennett Historical Research Services, will become President of NVMA effective Dec. 1. 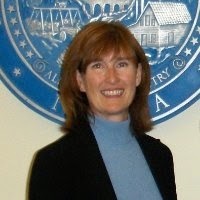 Bennette received her doctorate in history from Arizona State University, worked in historical research and policy analysis with Morrison Institute for Public Policy in Phoenix, and was a Research Historian with Arizona State Archives. Arizona and Nevada have traded positions in recent years as the number one non-fuel mining state in the country, with Nevada in first place when gold prices are high. 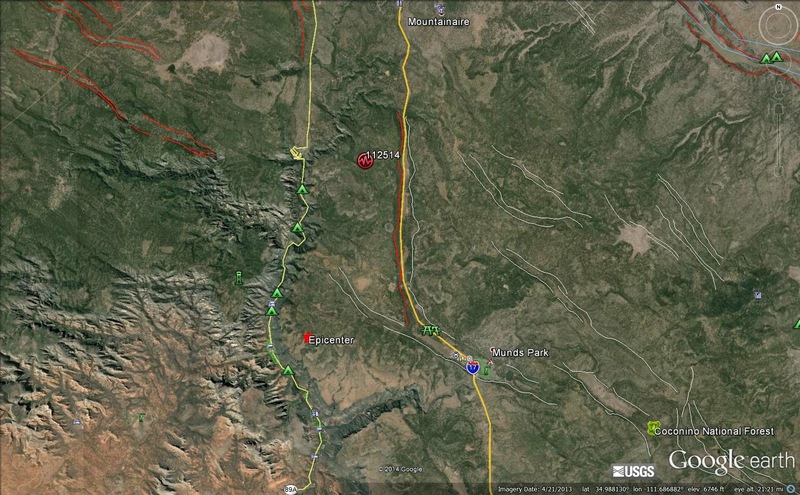 Residents in the Sedona-Flagstaff area report feeling a magnitude 3.5 earthquake that hit about 6 - 10(?) miles north-northeast of Sedona at 2:19 a.m. local time this morning. Dr. Jeri Young, who runs the Arizona Broadband Seismic Network here at AZGS, reports there were two smaller events in the area prior to the quake and one aftershock. The foreshocks were at 12:25 and 12:39 a.m. and the aftershock at 9:04 a.m. today. The Arizona Geological Society reports that "Long-time AGS member P. K. (Rana) Medhi [photo credit, AGS] passed away Nov. 7, 2014 at his home in Casa Grande. Medhi, former chairman of the Board of Governors of the Arizona Dept. of Mines and Mineral Resources, former adjunct professor of geology at Central Arizona College, and former Governor of the Mining Foundation of the Southwest retired in 1994 after 28 years at Cyprus Amax Minerals Company. He had a M.S. degree from the University of Arizona and was a certified professional geologist and an Arizona - registered geologist; he worked as an independent mining and exploration geologist after his retirement." On a personal note, Rana played a key role in preserving the historical mining records and other assets of the Dept. of Mines & Mineral Resources when they shut down in 2011 due to a budget shortfall. With an hour to go before the agency closed, he signed an agreement to make AZGS temporary custodian of the materials, until the Legislature could approve the merger of the agencies. How did we miss this story about vampires in abandoned mines in Arizona? Well, Arizona, it looks like we had a chance to rid Arizona of vampires in our abandoned mines, but we blew it. Joe Hart won re-election as State Mine Inspector a couple weeks back with over 1 million votes or 98.29% of the votes cast. There was no organized opposition, but write-in votes totaled 18,312. The Secretary of State's office has not posted who got those write-ins but I wonder if some of them didn't go to write-in candidate Ian Kobe who ran on a campaign of "No Arizona Mine Draculas." His Facebook site (his only campaign outlet?) says "A vote for Ian Kobe is a vote for an AZ with less Draculas!" [sic] and laments that children cannot play in abandoned copper mines because Joe Hart has not cleaned out the vampire dens. I know and work with Joe. I interviewed him on our video magazine "Arizona Mining Review" and I have to admit, never once has he mentioned vampires, let alone vampires in mines, active or abandoned. Joe, all I can say is that I'm speechless! And the Arizona news media, obviously beholden to the pro-vampire community, ignored this burning issue in the Mine Inspector's race. I had to read the Chicago Sun Times to find out about it. And all this raises the question that if the mines are full of vampires, can zombies be far behind? So kids, you're going to have to stay out of those old mines for a while longer. Jeri used 3 of Northern Arizona University's nearby analog seismic stations and a different crustal velocity model than the USGS model. However, they used 42 phases and we used only 9 in making the calculation, so we are not sure which is the more accurate location.